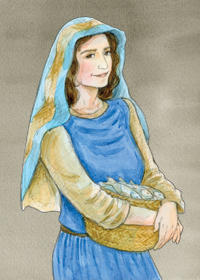 Mary was chosen by God to be the mother of his son. By the simple act of saying “yes” to God’s will, she became the greatest and first among all of our saints and a patron for all of us. Mary has been the intercessor for all people who call upon her and for many causes. Her appearance has been reported many times on earth--in the last few centuries at Lourdes, Fatima, La Salette, Guadalupe, and Medjagore. As Our Lady of Guadalupe, Mary became a powerful intercessor for the indigenous people of Mexico at a time when the armies of Spain were conquering them. Her story is inextricably tied to the story of St. Juan Diego, to whom she appeared a number of times. Juan Diego, a poor peasant who was going to church to pray for the recovery of his uncle, received his first vision of her and was told that she had a special errand for him. He was to go to the bishop of Mexico City and tell him that she wanted a chapel built on Tepeyac Hill, a mount near Juan’s village, where all who were troubled could seek her aid. Though Juan was not initially believed by the bishop, Our Lady provided him with “proof” of her visits to him in the form of the imprint of her image surrounded by roses on his cloak. It is from this original image that current pictures of Our Lady of Guadalupe have been created. A chapel was eventually constructed on the site as Our Lady requested. Today, a great basilica stands on the site. Through Juan Diego, Our Lady achieved the conversion of hundreds of thousands of the Mexican indigenous people. Pope John Paul II proclaimed her the patron saint of the Americas. She is also the patron of the unborn and the elderly. As the pre-eminent saint of our Church, there are many feast days in honor of Our Lady. We honor her as Our Lady of Guadalupe on December 12. Under the title of the Immaculate Conception, Mary is also the patron of the United States. Have you accepted God’s will in your life? Pray for understanding of what God is calling you to do.